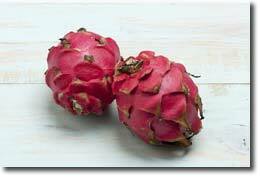 Dragon Fruit Facts - iTi Tropicals, Inc.
Dragon fruit, also known as pitaya or strawberry pear, is a fruit of growing popularity. The fruit has been referred to as the most beautiful in the cactus family. It is cultivated in the subtropical and tropical regions of Central Mexico, Central America, South America, and Southeast Asia. Each stem segment of the plant can grow up to 20 feet long. Flowering occurs during warm months taking approximately 45 to 150 days for fruit to develop depending on species. 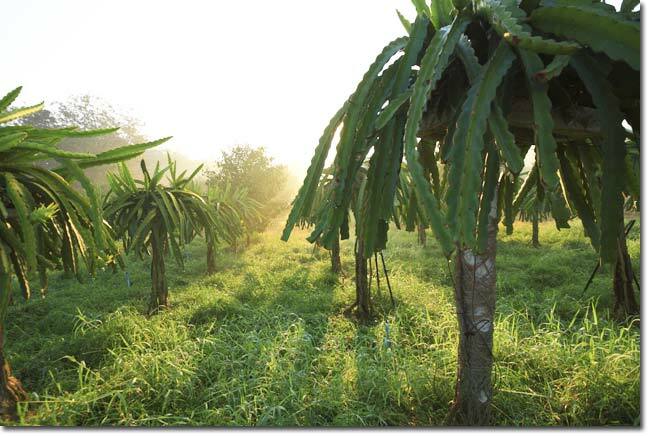 Upon reaching maturity, the dragon fruit reaches its optimal sweetness. If not harvested immediately the fruit will continue to grow in size but will not increase in sugar content (brix). The fruit varies in size between 0.5 to 3 pounds. The fruit has a hot pink or reddish skin with greenish scales. The inner flesh is white, pink, or red with numerous small black seeds. Compared to the bright, vibrant skin, the juicy flesh is actually quite mild in flavor, similar to a melon or pear. It is slightly sweet with acidic undertones. Its texture is a cross between a kiwi and a firm pear. 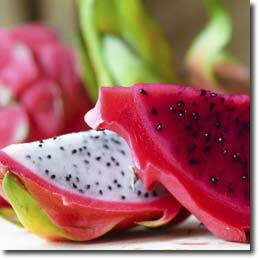 One of the major benefits of dragon fruit, specifically red dragon fruit, is its natural deep red-crimson color. This color adds an exotic look and feel to any product. 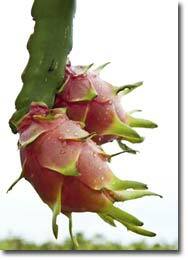 Dragon fruit is very appealing to consumers due to its exotic nature. It can be used in tropical drinks, smoothies, yogurts, ice creams, sherbet, tarts, jellies, syrups, sauces, and cocktails. It blends well with most fruits including banana, guava, coconut cream, pineapple, papaya, and mango. The dragon fruit's mild flavor makes it a unique ingredient for use in product development as it can be incorporated in a variety of items. It brings an exotic feel to a product without overpowering the palette. Imagine bringing a taste of the tropics to every part of day. Wake up with a toasted muffin topped with dragon fruit jam. Mix up a tropical mango-dragon fruit smoothie for lunch. For dinner, enjoy grilled chicken or fish topped with a blackberry-dragon fruit sauce. Top it all off with dragon fruit ice cream or sorbet which accentuates the crimson color of the native fruit. iTi supplies frozen red dragon fruit puree in pails. The product is 100% natural, GMO free, and produced from fresh, ripe, carefully selected fruit. It does not contain any artificial color, flavors, or preservatives. Dragon fruit puree is processed in a FDA registered facility which is HACCP and Kosher-certified.